I am looking into a Print on Demand service for my next self-published comic. Because it's going to have a little of everything from slapstick to biography, I'm calling it Eclectic Comics. 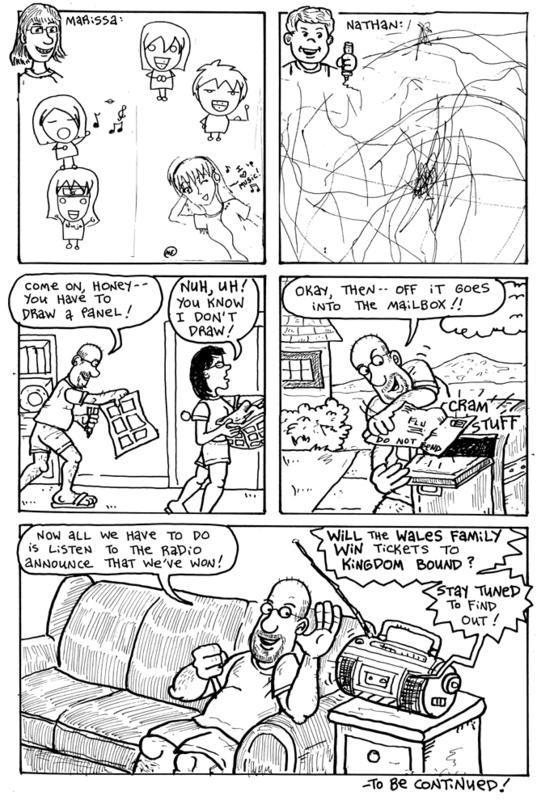 You might find any kind of comic strip in it. 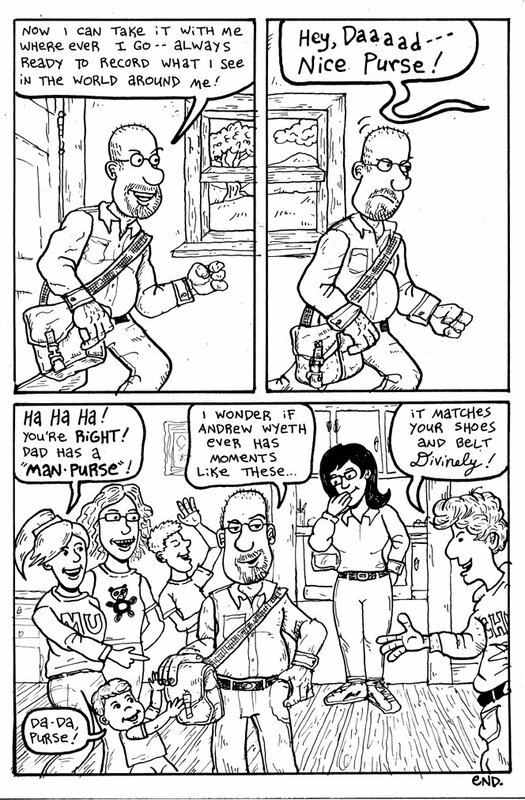 What ties it together is they were all made by me, except for the pages done by guest cartoonist, Anna Wales. The cover (above) is mostly finished, thanks to computer artist Daniel Wales. If the image looks familiar, it's my tribute to Action Comics #1 which came out seventy years ago about this time of year. Compare it to the image below. 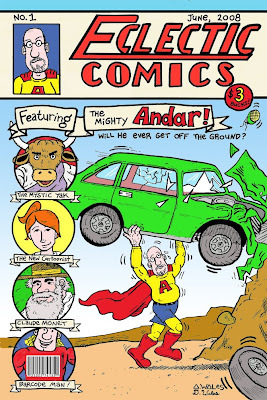 I just couldn't let this milestone of comics history go by without sullying it with the interpolation of a Mighty Andar image. Our local radio station is having an art contest to win tickets to a music event at an amusement park for your whole family. 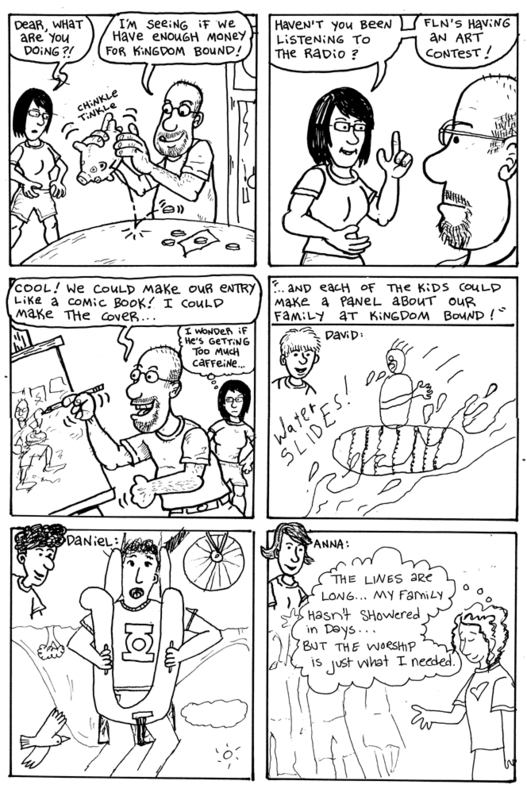 My family pitched in to make this family-made comic as our entry. Nice, what a neat idea! Good luck! Just for kicks, once in a great while, I like to get something from Cafepress with one of my characters on it. 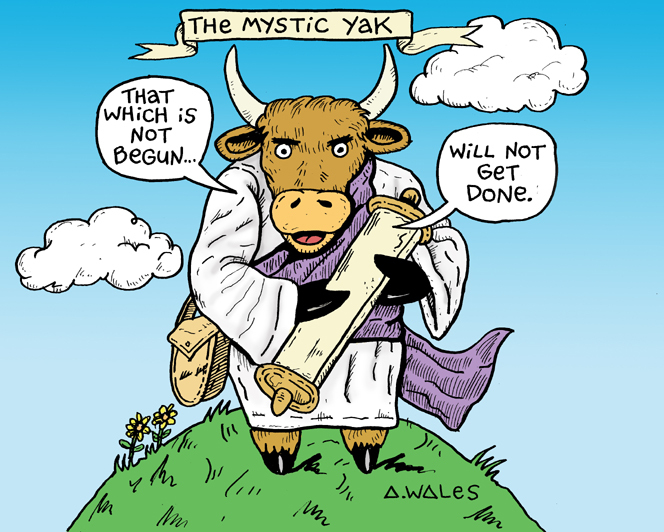 I had an idea for a Mystic Yak wall clock. Here's the design. I'm sure there's not a huge market for these except for me, but it doesn't cost anything to design the product and set up a store. Hence, The Mighty Marketplace! Your 'What if..' is so great! Hey and sign me up for a Mystic Yak something... button badge would be cool then I could have good Mystic Yak karma all day long... I just ordered one... Mystic Yak karma is Mine! Barcode Man ?!!!! Hilarious ! 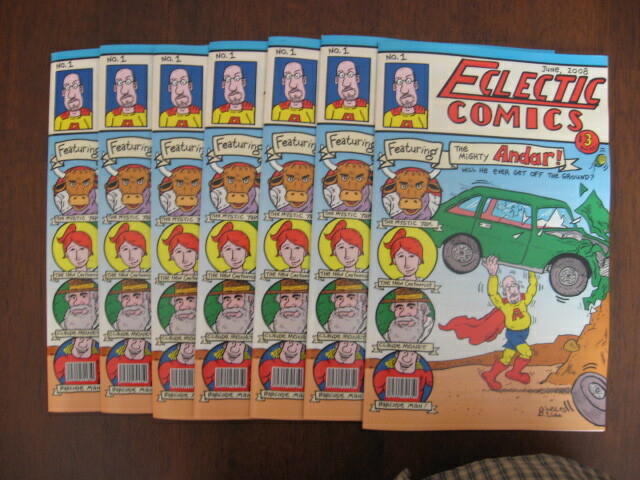 My first shipment of copies of Eclectic Comics #1 came from the printer today. I'm using a print on demand service called Ka-Blam. They look very sharp and professional, if I say so myself. Those look fantastic! It must feel great to have all your hard work in something tangible instead of just being on the internet. Thanks a lot, Tony. Yes it does. What printing service did you use for your book? Yours is a thicker paperback, right? andrewwales wrote: Thanks a lot, Tony. Yes it does. What printing service did you use for your book? Yours is a thicker paperback, right? Yeah, I'm using 360 Digital Books instead of Ka-Blam. Since I'm charging $17.95 for the books, I wanted to make sure they were the highest quality possible and full-color. Ka-Blam offers 80# cover and 50# interior paper (not-coated). My books will be a 12 pt (which is greater than 100#) Matte finished cover, and 80# glossy interior paper (which I think the Flight books used), for a similar price to what Ka-Blam offers. I'm not prepared to give 360 a ringing endorsement, since I don't have the books in hand yet. But I just got the proofs mailed to me yesterday, and I was really blown away. I'll post some pics of these on my site on Tuesday, if you're interested. Sounds nice. Yes, I would say my one complaint is that the covers on my comic are a little thin. However, if I recall, I think cardstock is an option. The colors look very nice. 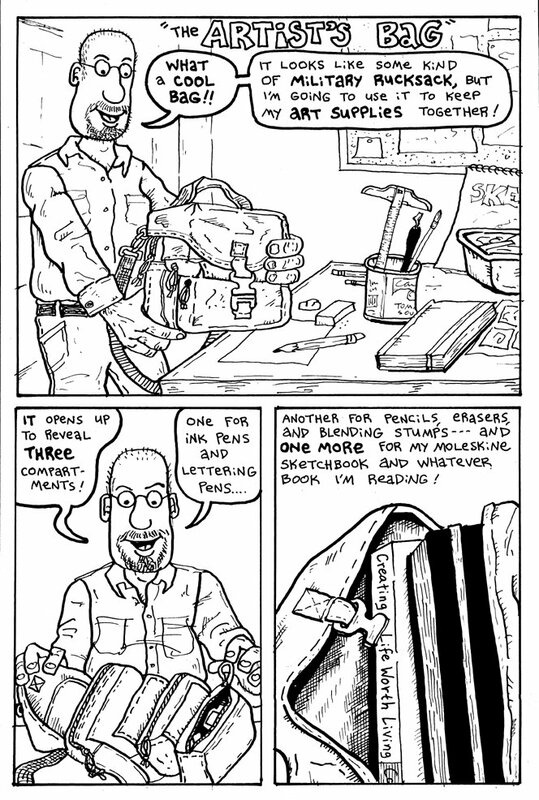 I want to make individual comics cheaply and then collect someday in a bigger paperback. I'll look into 360. For some reason i wasn't familiar with them when I was looking around. Overall, I'm very happy with the look of the Eclectic Comics. The link to my "store" at Indy Planet is below. Unfortunately, the preview images aren't showing for some reason. However, the comics turned out nice and can be ordered from there. Yeah, it took me awhile to find 360 Digital Books. I got a LOT of print samples and did a LOT of phone calls and e-mailed a LOT of other comic creators about advice on printers. I was really determined that my book look good and be "reasonably" cheap. That list should be very helpful for anyone looking into this. Thanks a lot!